Fall Decorating ~ I will be strong! I keep seeing hints of fall around and it doesn't help that we've had the world's shortest summer this year. We're already experiencing rainy fall weather here--I'm hoping summer makes an encore before leaving us for good. Still, I am holding strong and NOT putting out my fall decorations yet. I did, however, take stock of what I have...and took a picture, too! Some of this is new but most is from previous years. I need more *fall* decor since some of what I have is Halloween specific and I only like to have that out in October. Those three stacked pumpkins are new for this year--I want to make a pumpkin topiary to have next to the front door. 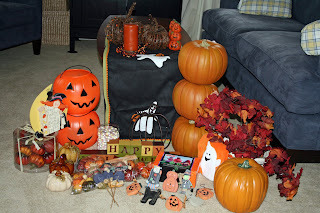 My fall decorations look so meager like this, but they sure do take up a lot of storage space! I'm looking forward to doing some new decorations this year--I love adding to my seasonal decorating each year. I went out on Saturday morning and hit a few yard sales before running errands--all by myself, no children in tow! Wow, what freedom! I hardly ever do that! 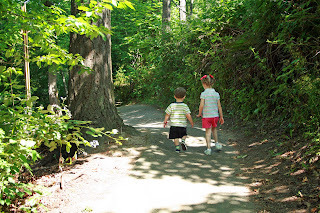 I wanted to bring one of the munchkins with me, but opted to leave them at home together so they could entertain each other in the backyard while my husband worked on pulling out more overgrowth on the slope in our backyard. He is SO close to having that whole mess pulled out! Anyhow, most of the sales I found were full of junk. One sale that was supposed to be a huge one in a church parking lot would have easily fit into my driveway. Such a disappointment! I did, however, buy this for $1--I was pretty pleased with that price. I like the texture and dimension it will add to one of my walls. 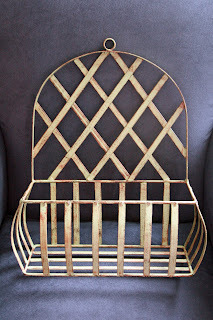 I think I'm going to put it in my laundry/powder room (yes it is a dual purpose room--not my choice!) and although originally I thought I would need to paint it white, I think the color actually will work quite well in there. It is a bit hard to tell in the pictures, but it is a yellow green color with a brown rub. Pretty and a bit different. Now I need suggestions on two things. 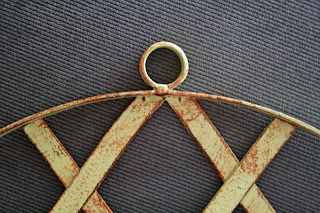 First is what to hang it up with--it has a big circle at the top for hanging. I was thinking of using a small knob from the hardware store. What do you think? Second, what should I put in it? Towels aren't really necessary since it just is a powder room with a handtowel. I'm a bit stumped on this! I think it will be put up just above the washing machine and very close to a window...in case that info helps! My poor sweet baby boy had his elbow dislocated by his sister yesterday. As soon as I saw him, I knew it had happened again. He was sitting on the ground just whimpering and crying and looking so pitiful. This happened for the first time in October when my husband had him by the hand and pulled a bit too hard. That time around we had to take Handsome to the emergency room since it was in the evening and we didn't know what had happened. Now that we know he is prone to Nursemaid's Elbow, we are so careful not to pull him by the hand. *sigh* My poor baby. I bundled him (sobbing) into the car along with his sister and we headed down the hill to our doctor's office. We had a short wait before seeing the doctor and my baby just huddled against my chest while whimpering--very unusual behavior for him. The first attempt to put his elbow back in didn't work all the way, so about five minutes later the doctor tried again and it worked. This was very different than the first time he dislocated it--that time they were able to pop it back in very easily. I hope this doesn't mean that the next time it will be even harder to get back into place. He's find now although he kept rubbing his elbow for the rest of the day. Still, he's clearly not in pain and his fingers are nice and pink, so I think it just is the memory of the pain. Added to all of this, I found out yesterday that we'll be going back to the children's hospital in a few weeks for more testing for him. Last time we were there he had a chest x-ray and a barium swallow. It turns out the chest x-ray showed some thickening of his airway. So now we're heading back for a video fluroscopy and a consult with the pulmonology department. And this means the ph probe and endoscopy may need to be done sooner rather than be pushed off until next summer. 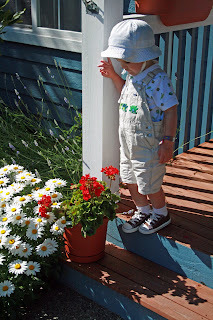 Anyhow, in the hope that the rest of Handsome's week goes better than the first two days of the week, I'm making this post all about my baby boy and sharing some recent pictures! Mama loves you, Handsome! 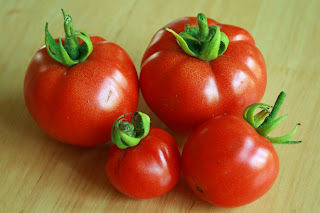 The other week we harvested our FIRST organic tomatoes! They were gorgeous red globes chock full of meat and with hardly any seeds. So tasty and good! 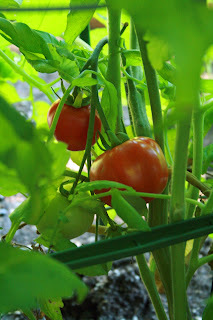 At last count there were 39 more tomatoes in our little garden in various stages of ripening. I have a feeling that most of them will be ripening at the same time! Good thing we love tomatoes! My tomato plants are HUGE. 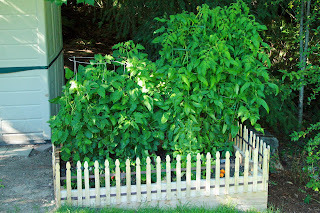 The Early Girl plants are almost 6 feet tall and the Roma plants are about 5 feet tall. They're just enormous! Next year I need a better staking system. I wasn't thinking they would be this tall, so I'm a bit worried they'll fall over as the fruit at the top ripens. I've already trimmed off extraneous (non-blooming) branches and done what I can to lighten them...now it is a wait and see approach! Mmmm, I'm looking forward to harvesting more tomatoes! For more Talk About Tuesday, visit Lara at The Lazy Organizer. Joy at Joys of Home is having a Paint Party where you're supposed to show off what you've done with spray paint. Bonus points if you use something other than black. No bonus points for me though...I've just begun the spray paint phase of my life and have only used black thus far! I have to say, I'm very impressed with how easy it is to use spray paint and definitely see more spray paint in my future! I posted these pictures back at the beginning of the summer, but I'm still thrilled with the "after", so I'm sharing them again. I'm anti-oak (despite my oak kitchen cabinets...that's another project waiting to happen!) and just love the look of these now that they're painted black. They match my iron chandelier much better now! 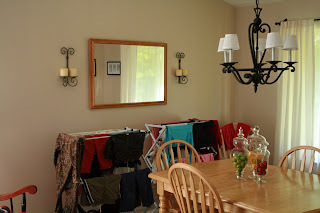 Here's the before picture...including drying laundry! And here is the after picture...what a difference! 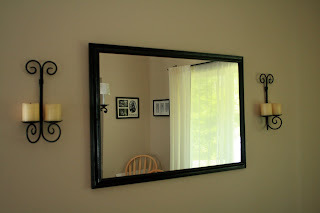 I painted the candleholders as well as the mirror frame. And here is the view from my front door...well, this was the view--I've made some decorating changes, but this is basically what it looks like now. So, as we know, I wasn't really all that happy with my mistreatments in my kitchen. They were kind of "eh" in my opinion and just weren't doing much for me. So yesterday I decided to do something about it! As a refresher, here is what my window looked like before I decided to mistreat it...I still like this look and am not opposed to returning to it. And here we have what I did yesterday. Actually, I did this after filling in all the nail holes from the plates and the previous attempts at mistreating. My poor wall was looking quite sad! I still have to touch up the paint, but at least the bajillion holes are filled! My bad picture aside (camera was on the wrong settings--ooops! ), I like this mistreatment SO much better! That painfully obvious horizontal crease isn't at all obvious in real life--I didn't notice it until looking at the pictures. I think I need to shorten the mistreatment a tad, but other than that, I'm really liking this one a lot and think I'll keep it for awhile. No sewing at all--just some hot glue, safety pins (to do the gathers and attach the bows), and upholstery tacks. So after tackling the kitchen window, I decided to rework my mistreatment on the sliding door in the eating area of the kitchen. Here is what it looked like before. Blech. Just didn't work for me. At all. Here is what it looks like now. Much better--except it is a bit too long and needs to be shortened so that you don't feel like ducking as you head out the door. And here is a bad picture of the two windows together. 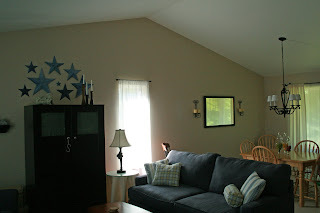 Further down the wall (past the sliding door) is the family room and that is where I have the faux roman shade I posted about earlier in the week. I'm still unsure about having the two different mistreatments in a row (this version and the faux roman shade) but they are two different rooms, so maybe it works. 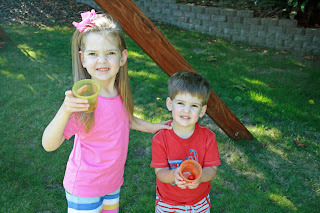 So I blog-hopped my way over to "Just a Girl" and was having fun looking around on her site and before I knew it, I found a new project idea! 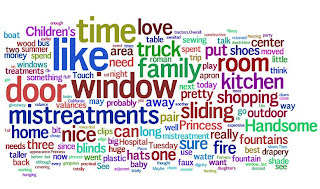 She found a website called Wordle and you can use it to create "word clouds" out of any words you input. So neat!! Here is her post where she made a Wordle and framed it. By the way--there is no way to save your Wordle as a jpeg. You have to either print it, save it in a public gallery (no privacy in Wordle land! 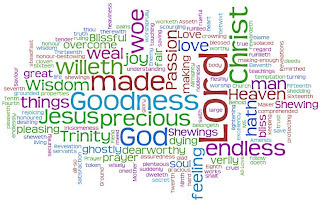 ), or do a screen capture...which is what I did in order to show you this little Wordle. 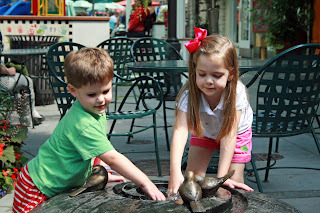 We've been at Children's Hospital two times over the last 1.5 weeks and have taken advantage of the opportunity to go to a nearby outdoor shopping center so that the children can play in their outdoor fountains. 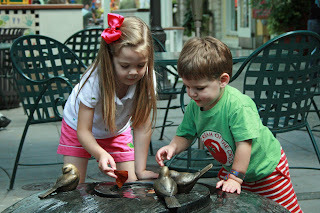 It is such a pretty shopping center and not at all typical for our state. It seems more like one you would find in California. Princess and Handsome love the fountains there and it is a nice way for them to use up some energy before the trip back home. For our second trip, Princess wasn't with us as she was spending the night away from home for the FIRST time ever! She spent the night with Grandma and had a wonderful time although she returned home exhausted as she had no nap and stayed up until 10:30pm! So Handsome and I set out alone before dawn on our trek to Children's Hospital. 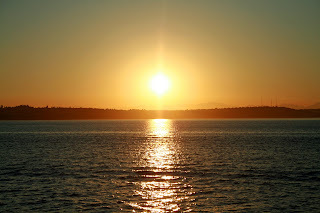 We were rewarded by a gorgeous sunrise as the boat traveled across the water. Of course about an hour away from home I realized that I forgot Handsome's shoes at home! 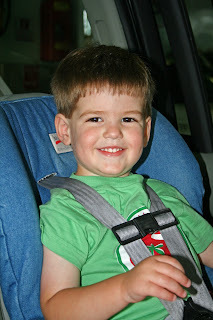 I put him in the car in his jammies...and didn't pack shoes! Whoops! 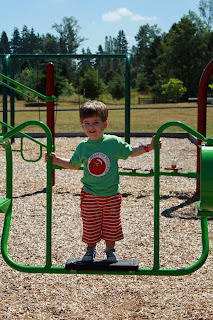 He wore his jammies for his chest x-ray and his barium swallow test and then we had a few hours before his next appointment at Children's, so I got him dressed and we headed off to the outdoor shopping center for breakfast, shopping, and fountain play. It was so nice to sit at a table outside and eat our breakfast--very peaceful and nice to spend one-on-one time with my baby boy. 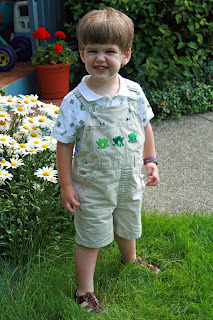 After the shops opened, I bought him a pair of Merrell's for fall. Not shoes I usually would pair with summer shorts, but I didn't want to waste money on another pair of summer shoes. 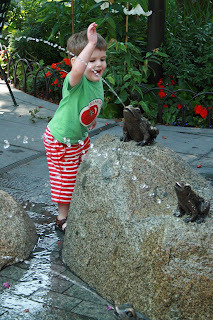 Then my baby had some time to play in the fountains before we went back to the hospital. 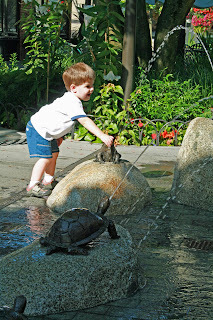 He loves this fountain with turtles and frogs spitting water at each other--I think he would have spent all day there if I let him! 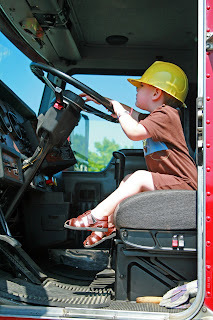 For this week's "Talk About Tuesday" I'm talking about trucks! There has been a lot of fluff talk around here lately and not enough truck talk. (Re-read my journal title if you need a refresher.) 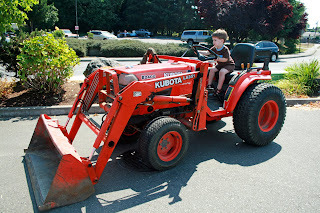 We went to our town's "Touch a Truck" event this weekend--and the adjacent Farmers Market joined in with "Touch a Tractor". Needless to say, Handsome was in his element and Princess was pretty pleased too! The gravel company gave out plastic hard hats (flimsy ones--but very neat nonetheless!) and they were a huge hit! Makes a nice change from our stash of plastic fire hats. We have so many fire hats since we stalk the fire truck every time it makes an appearance. 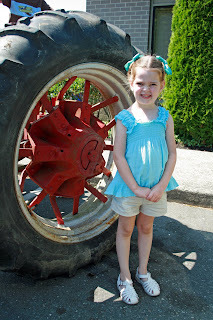 Princess is about 47 inches tall (probably a bit taller because it has been awhile since she was measured) and this tractor tire was taller than she was! We had to pry Handsome away from the tractors. Overall it was a great way to spend some time on a Saturday! 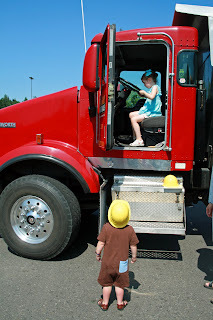 We saw tractors, a fire truck, police SUV, school bus, city bus, cement mixer, dump truck, dive boat, a pump truck, and probably something else that I'm forgetting. I love free events like this for children. Mistreatment: (n). 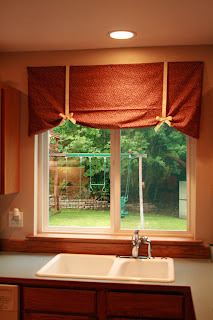 covering for a window that is quick, cheap and pretty. may or may not need hardware does not require sewing. a real designer's worst nightmare. 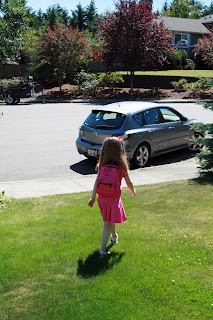 Join the Mistreatment Party today over at Nesting Place! My kitchen flows through to my family room with a small eating area in between the kitchen and family room. 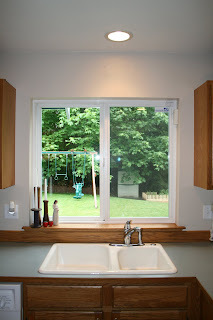 It is a nice area, but not at all spacious, so I want the window treatments in the area to go together--there is one window above the kitchen sink, a sliding door next to the kitchen table, and a huge long window in the family room. 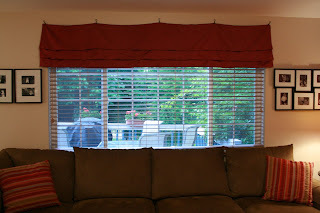 We moved here almost five years ago and I immediately took down the vertical blinds that were on all three windows--I can't stand those things! The windows were naked until June when I started mistreating them. 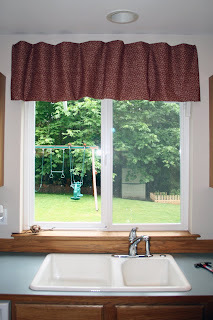 Oh, and I put up wood blinds on the big long family room window...but now I need to save up money to put those on the other windows--those are expensive! Anyhow, I'm not sure I like my mistreatments. 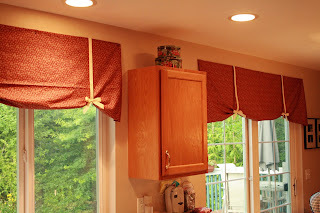 Maybe that's because I really don't like valances (well, except for the cute one in my daughter's room) and these mistreatments essentially are valances. I'd love to do long panels on the sliding door, but that isn't practical seeing as my two year old can reach the door from his highchair. Those would be a hot mess in no time flat. Another reason I'm not sure I like my mistreatments is my mom's reaction to them. She came in my house and commented on how I did something with my windows. 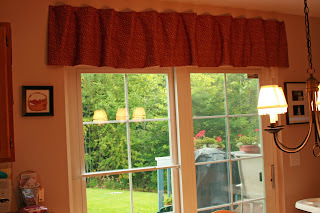 I explained my mistreatments and awaited her opinion--I thought she'd really like the faux roman shade in the family room. Um, no. Her comment was "well, I really like the wood blinds you put up before." And that was that. Ouch. Soooo...all this blathering is to ask you to be very honest with your opinions! Tell me what you think and give me constructive advice, please! I have to adjust the mistreatments anyhow because they're all at different heights (I was trying to see what height I like best) and that doesn't work for me. 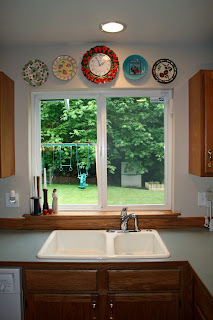 Oh and yes, I've posted some of these pictures before--but I hadn't done the sliding door then. And here it is now. This mistreatment is too high (unfortunately!) as compared to my sliding door, so it needs to move down a touch...at least that will hide the alarm sensor on the window a bit more. Here is a (bad!) picture of my sliding door. 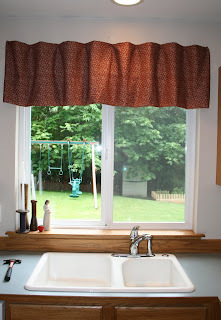 See, this totally looks like a wimpy little valance above the door. I'm not liking this at all. Plus it needs to be moved down because you can see the top edge of the door too much. 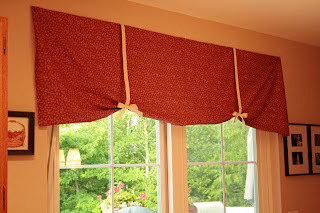 Here is the family room window--this is a faux roman shade that I did using straight pins and drapery clips. I like this one the best of the three mistreatments, but I'm not sure that hanging it from drapery clips on nails is working for me. Eh, truthfully I'm not sure about anything with these three window treatments! Behind My Red Door is hosting a fall giveaway with lots of great harvest goodies. You have until Sunday at noon to enter. Good luck! 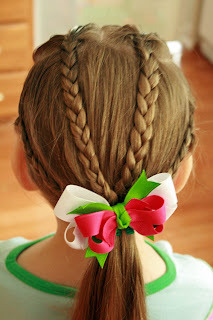 I tried a new hairstyle on Princess the other day and she LOVED it. She was so excited to run and show her dada--made me glad I tried this one on a weekend so that he was home to tell her how pretty she looked. It just is four braids (a bit hard to see some of the braids in this picture) from the front of her head that I gathered (along with the rest of her hair) at the nape of her neck and added a bow. Always a bow! And then there are the days when Handsome says he needs a bow too. 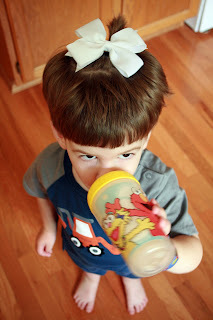 I try to limit his bow wearing to the house, but one time I did let him wear a bow to his sister's ballet class. He was so excited! 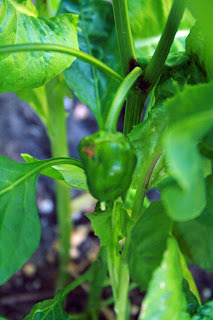 Woohoo, we're finally harvesting something other than romaine from our vegetable garden! My Early Girl tomato plants are five feet tall (no exaggeration!) and we're finally seeing the first red tomatoes! Woohoo! The roma tomato plants are a foot or so smaller and the tomatoes still are green...but I have faith they will get red soon! The other day the children were thrilled when I pointed out that our first strawberries have turned red. Oooh the excitement over those few red berries!! 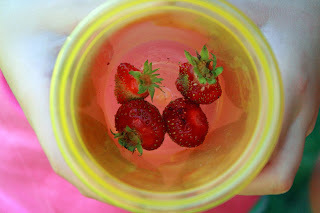 I know you're supposed to pinch off the flowers and whatnot the first year of your strawberry patch, but that didn't sound very fun to me...so I let them go. 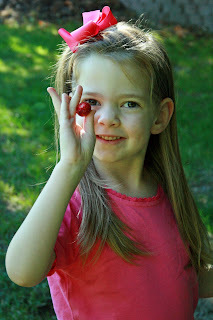 It looks like we'll have more berries soon, too! Apparently this wasn't enough of a harvest for us. Well, okay, truly we only picked the strawberries--the pepper obviously wasn't ready and the tomatoes needed a couple more days...so truly we picked six strawberries... ANYHOW, we decided to push our luck (please note that I use the term "we" quite generously--really it was my husband!) and pull a carrot too...despite me pointing out that the bushy top of the carrot wasn't very bushy. Um, yes, that would be a carrot. We all had a good chuckle over that and then we stuck it back in the ground. 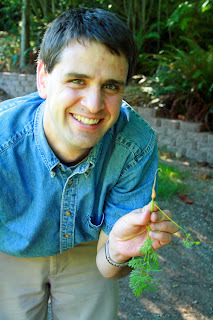 Man, these carrots are a pain in the rear--first hardly any of them sprouted and now they're taking for-freaking-ever to grow! Hopefully they'll start growing a bit better now that they're established. 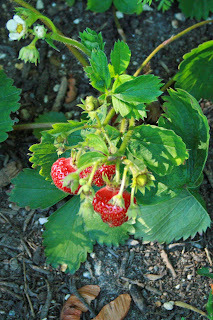 A few more parting shots of the strawberries...since they really were all that we harvested. 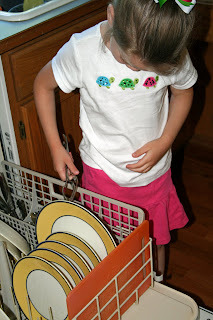 I recently added a new chore to the list for 4.5 year old Princess--she now is in charge of unloading the clean silverware from the dishwasher. 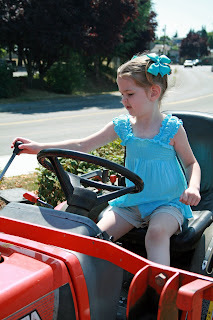 Why did I wait so long to give her this chore? She LOVES it! The other night she practically was in tears because my husband was putting the silverware away. Crazy. What's even better is that Handsome is insanely jealous that Princess "gets" to do this job. She really wants to unload the rest of the dishwasher, but she's not tall enough to put anything into the cupboards yet. Sometimes as a "treat", I'll let her unload some of the plastic stuff onto the counter. I'm going to have such a rude awakening in a few years when she realizes that unloading the dishwasher really isn't anything to be all that thrilled about. In the meantime though I'm going to enjoy it!